EAST VAIL – Homecoming came just in time for the Vail Mountain School volleyball team. Usually, Homecoming is tough for a team with all the pomp and circumstance associated. For the Gore Rangers, it provided focus Saturday after a big win over Battle Mountain earlier in the week. And Hotchkiss was the unfortunate recipient of VMS’ focus. 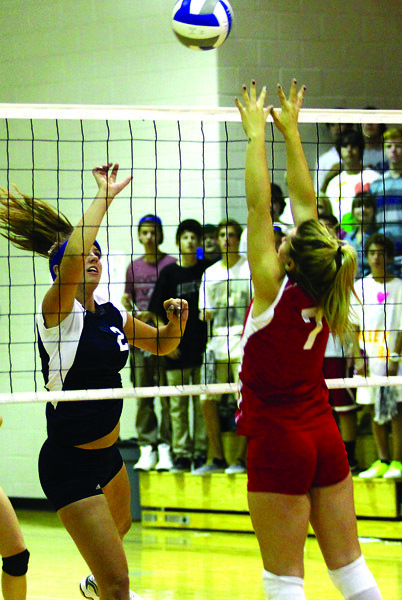 The Gore Rangers made it a quick affair against the Bulldogs, winning, 25-10, 25-12, 25-7. Hotchkiss scored consecutive points only twice. “I said to the girls after the game, ‘You know who had a good game? Everyone,” Garvey said. VMS raised its record to 6-3 overall and 2-1 in the 2A Slope. More importantly, the Gore Rangers seemed to have righted the ship after a little dry spell earlier this month. VMS will be very busy this week. The Gore Rangers are at Soroco Thursday and Rangely Friday. Those are both league games. VMS is then at home for West Grand which is not a league contest. EAST VAIL – Vail Mountain soccer dropped a tough 2-1 decision to Moffat County Saturday at Bandoni Alumni Field for its first league loss of the season. Garret Cerny scored with the assist going to Clay Buglione in the first half. VMS (3-5-1 overall and 2-1 in league) will gear up a road game Saturday against Aspen. This game against its long-time rival will be the league match. The two teams played to a draw earlier in the season.